Meanwhile, soviet union moves to the moon and starts plotting against Planet America. 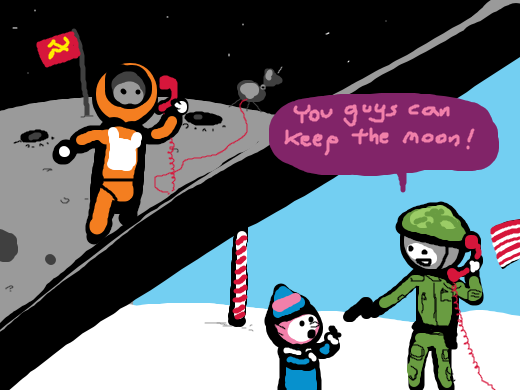 Russians won the race to land on the moon first. Meanwhile, Americans conquer the north pole, arguing that it's a better investment. Saxton Hale jumps out from behind a crate and attacks the unsuspecting hippie. Hah! Try and catch me now, lead singer from Counting Crows! I am pac-man and I have legs to run away from you and your depressing music! Pacmans spirals deeper and deeper into depression and eventually starts consuming all the pills he collected in his life, one after another. The removal of his wisdom teeth made Pacman's job ever so painful. Eventually, he would have to find another job.